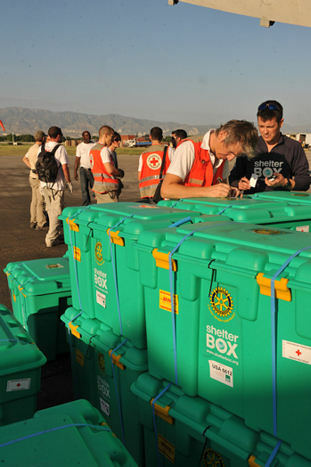 April 2012 – ShelterBoxes are urgently needed for disasters like the flooding in Brazil, the cyclone in Madagascar and the earthquake in the Philippines. With the money donated by the people and schools of the Gravesend area, ShelterBoxes can be sent to help people in these disaster areas that have lost everything. What’s in a ShelterBox? The Rotary Club of Gravesend has for several years, with the help of the people of Gravesend, been providing ShelterBoxes to help people in disaster areas. Often we do this in conjunction with local organisations such as schools which raise money to by a ShelterBox which costs £500 each. We have held street collections in Gravesend and these have raised over £800. By adding some more money to this we have bought additional ShelterBoxes that were sent to Haiti. While we raised money ourselves to buy ShelterBoxes, the scheme has proved to be an excellent way to introduce schoolchildren to helping with disaster relief. We aim to visit all the primary schools in the area to raise awareness of ShelterBox and to invite schools to raise money for one of their own. If they wish to do this, then a specific box, with an individual number, will be sent to whichever part of the world has need of it. The school is told when and where ‘their’ box has been sent and they can track it on the ‘ShelterBox’ website. 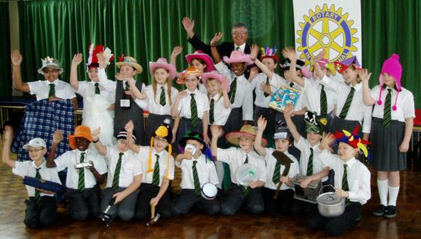 To date we have visited more than ten local schools. Sometimes the schools send their money directly to the ShelterBox Headquarters in Heston, Cornwall and other times they have sent it through the Rotary Club of Gravesend. In the case of Haiti, local schools sent six of ‘their’ boxes which were supplemented by the two boxes sent directly from our own club. A list of some of the local schools that have become involved in ShelterBox are, Cobham Primary, St. Joseph’s Convent, Kings Farm Primary, Riverview Juniors, Shears Green Juniors, Singlewell Primary, Vigo Village Primary, Holy Trinity Primary, Wrotham Road Primary, Whitehill Primary and Culverstone Green Primary. The enthusiasm we find at the local schools was typified by our visit to Riverview Junior shortly after the Haiti earthquake where pupils collected £1,000 towards ShelterBox by a “Hats for Haiti Day”. The Gravesend Reporter paper documented that the head teacher Mrs. Rosemary Dymond presented a cheque for the money raised to Gravesend Rotarian Chris Keeble. The Rotary Club of Gravesend would like to thank the children¸ parents and staff of all the participating schools for their support of ShelterBox. The following information was received about the first of the Gravesend ShelterBoxes sent to Haiti after their terrible earthquake. 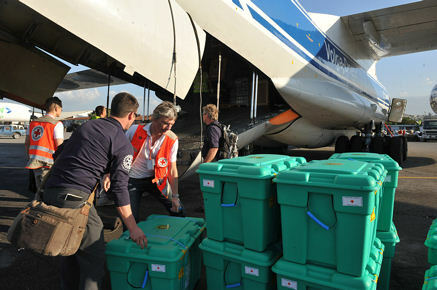 “The first ShelterBoxes have arrived in Port au Prince and hundreds more are due to arrive. The ShelterBox Response Team has been in Haiti’s capital since Thursday, took delivery of the first ShelterBoxes at Port au Prince airport yesterday. The team say twelve of these boxes will be used to build an emergency field hospital at the airport. More about ShelterBox from the Shelterbox web site. For more information or if you would like to help us, please email Chris Keeble or phone him on 01474 872698.